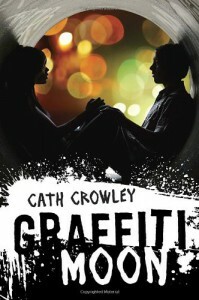 Graffiti Moon has a lot of elements in it that I enjoy in contemporary books. 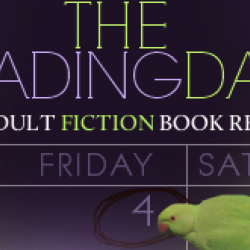 I love books that take place over 24-hours, and this adventurous tale takes place over the course of an evening. The city hums with energy and there is a sense that anything can happen. The characters are all a little older, just facing adulthood and ready to conquer the world. Art is in the backdrop of the story, with Lucy’s glassblowing, Shadow’s graffiti art, and Poet’s poetry adding a creative vibe.Lucy is smart and artistic and has a great sidekick, the psychic Jazz. She feels she and Shadow may be soul mates, but she keeps just missing him whenever she tries to find him. Ed has had a tough time of things, after dropping out of school, losing his girlfriend, and losing his mentor. He is feeling lost and directionless, though is passionate about art. He thought Lucy was someone who understood him, but their comically bad date seems to have shut the door to their relationship. They seem to barely tolerate each other at first, and it is fun to see them get reacquainted.The story is told through Ed and Lucy’s alternating POV, so we can get a sense of who they are and their feelings toward each other. Over the course of the night, Lucy and Ed’s quirky friends, and the colorful strangers they encounter make for a fun and eventful evening. There is so much going on with them as they run around town on their quest, and even have to dodge a bad guy who is hot on their trail.Reading this book is such an exhilarating experience. The chemistry and passion of the characters and energetic nature of the story makes it easy to fall for. The writing is vivid and gorgeous with sharp and witty dialogue. I could just picture Shadow’s paintings that covered the city. This exciting, hope filled time in their lives is expressed brilliantly and honestly. I didn’t want their night together to end.This artistic and expressive story is easily one of my favorite reads of 2011 and one of the books that has me wanting to seek out more contemporary books. The friendships, passion, beauty, and adventure all added up to a breathtaking read that is reminiscent to Nick & Norah’s Infinite Playlist. If you are looking for an absorbing and heartfelt coming of age with romance and excitement, give this one a try. I can’t wait to read more from Cath Crowley.